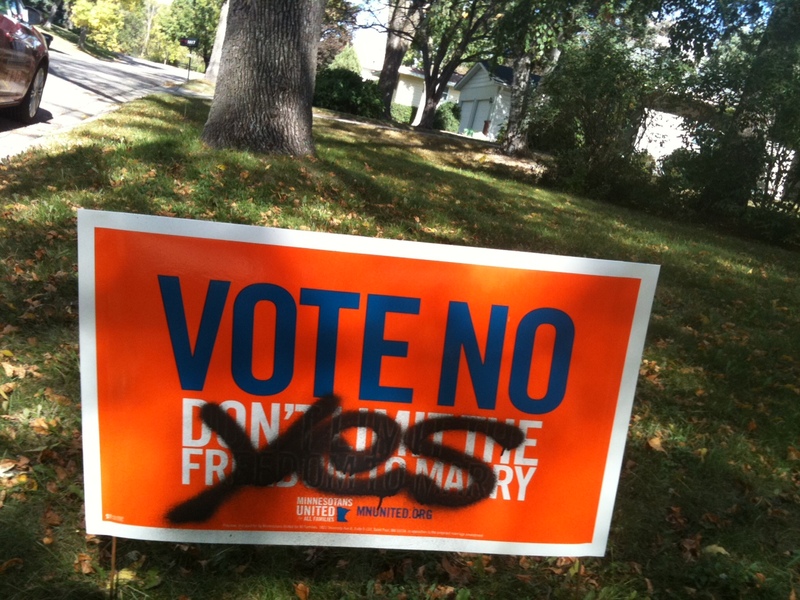 After writing about Minnesotans for Marriage’s (1) calling Vote No Supporters Atheists and then (2) declaring themselves victims, I came across a story about lawn signs of Vote No supporters being vandalized in Bloomington. Nice, right? We might disagree, but let’s respect each other. Seriously, Chuck? Casualties? First, you call run-of-the-mill voter outreach “stalking,” and now you’re suggesting — what? That our side wants to kill you? People get called Drama Queens for less. Got that, single parents? Got that, people who marry later in life, or who decide not to have children? Got that, people who would love children but are physically unable? Got that, people who adopt children? Your marriages are less. But careful pointing that out to our friends at Minnesotans for Meddling in Other People’s Marriages. They’re allowed to judge you. They put this harmful amendment on the ballot. They are judging not just gay people but anyone in any family that doesn’t look like Leave it to Beaver. But they’re allowed to do that. Because they’re the real victims here. His Excellency raises money by judging your marriage. 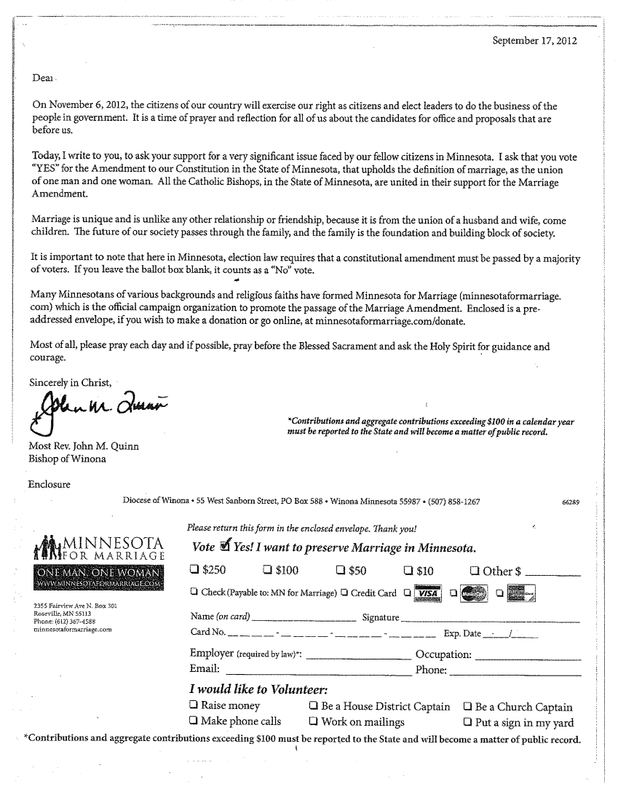 Your marriage may be less if you do not have children, but at least know that your godless union does serve a purpose: The Most Reverend John Quinn can raise a little money off of his judgement of you. Oh absolutely! They can dish it out but they can’t take it. Pathetic….